Painting from the head is liberating! I have carried on with the new style and made more progress. No longer do I feel restricted painting from photos - I now feel I can create anything I want. The thought process is harder though as you don't just paint something you saw and liked, now it also counts what I want to portray and how this can be done effectively. I'm so much more excited about where this will take me. 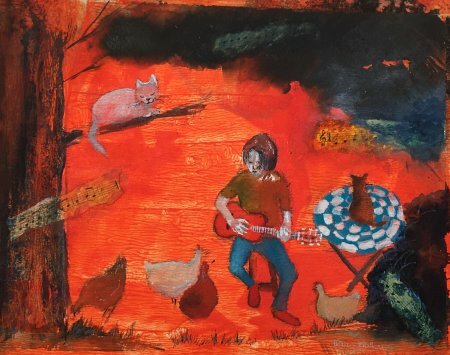 The attached image is my son playing his guitar to the chickens. The chickens and cats were far less attentive in real life though. What a fun painting this was - it also incorporates collage.